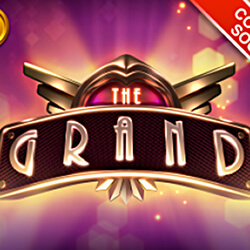 The Grand is an Art-Deco themed video slot that draws inspiration from the Great Gatsby, and invites players into a colourful world of glamour and luxury. Set in the Golden Age of Hollywood during the 1920s, this slot is set to induce some Déjà vu for those players that have been playing Quickspin’s games for some time. Other elements of their games can be found in this game, such as Second Strike, Wins of Fortune, Sevens High, as well as Yggdrasil Gaming’s Nirvana. The Grand is slightly unconventional in its set up. There are 6 reels set out in geometric form, where players will find rows of 3, 3, 4, 4, 5, 5, symbols high from left to right, and consists of 214 different ways to win. The game also features synchronised reels that see between 2 and 6 reels synced to stop at the same positions. Random wilds are also featured, and when triggered, between 4 and 8 wilds are randomly added to reels 2 and 6. Nudge reels are included, and when they come into play, the player is able to nudge a total of three reels to their benefit. The free spins bonus feature three different features that can be unlocked and combined for each spin simultaneously. The player will first need to land 3 or more scatters, which will then provide the player with 6, 9, 12, and 15 free spins respectively, depending on how many scatters land.